Photolalia: East Of Oildale -- Some images... and a few brief words about them. 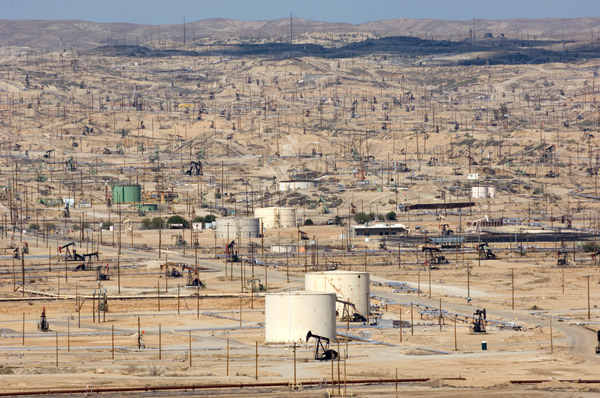 (Kern River Oil Fields, Bakersfield, 2008; click on image for larger version. Image copyright Hamish Reid). Bakersfield has been one of my bigger photo obsessions over the years  a Central Valley town with a varied history that combines Okies, country music (Buck Owens and Merle Haggard, at least, and with a touch of Bob Wills), agriculture (on a vast industrial scale), industry, and ... oil. The oil's hard to miss: there are refineries throughout the area (there's even a couple within the city limits), and there are those mesmerizing nodding-donkey pumpjack pumps everywhere: vacant lots, the side of the road, agricultural fields, suburban side streets, even domestic backyards. 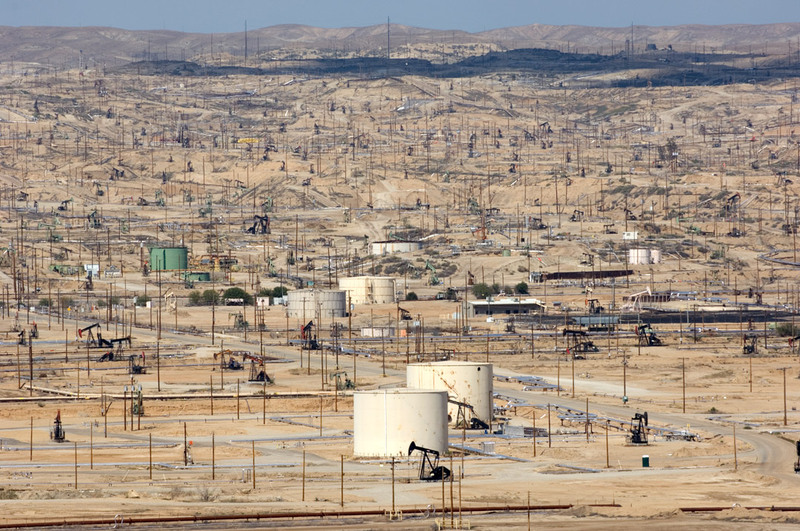 The surrounding area has vast barren hillsides and lots just covered in pipes, pumps, tanks and wires. Oh, and the place is hot as hell in summer. The first time I saw all this I was amazed and enthusiastic about the visual richness and steely complexity (but how could people live like this? Well, I spent some time a long time ago working in a refinery as a process control engineer, so the environment's kinda home to me, at least). But also, for years, I've struggled with how to show all this: the most difficult thing to depict, of course, is the constant slow up and down movement of the pumps; that's something more suited to video, and not something I've spent much time thinking about for still photography. I think it's the sheer scale and ubiquity of the industry, the way it's insinuated into almost every part of the area and everyday life, that's the real challenge. Over the years I've tried and failed: it's usually just too difficult to evoke or transmit the strangeness, and images of single pumpjacks don't really do it.